Mr. Karlheinz Böhm made the experience in Ethiopia that people don’t want to have the Solar-Cooker because he seems to be a primitive and too simple device. And the problem is often, the food must be ready at a special time, even if the sun is not shining. 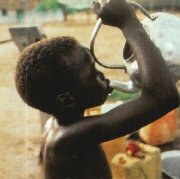 On the other side too many people especially children die by diseases caused by a poor quality of the water. About 1.6 Million people die every year by contaminated water. These points have been the impulse for developing a small electronic device called Metamorphosis to make the Solar Cooker more attractive. Producing potable Water: Many solar-cooker exist already world-wide to prepare meals. 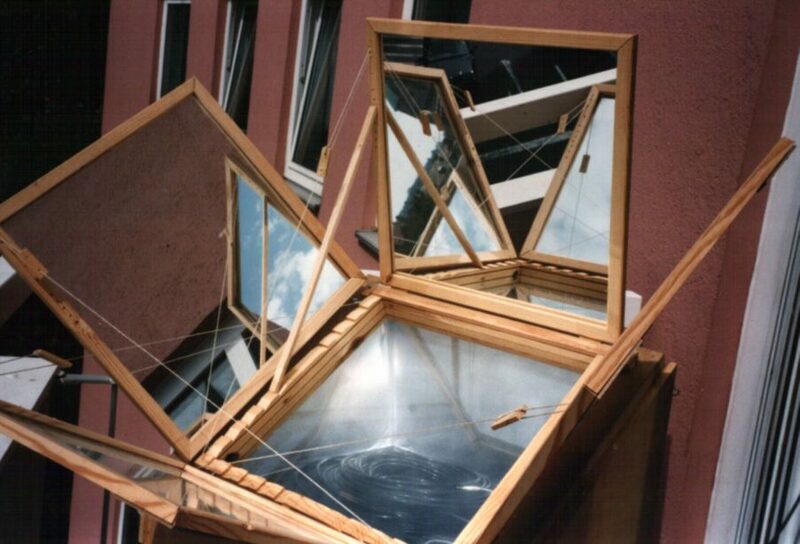 Such a solar-cooker can also be used very well in order to clean water simultaneously. That starts with temperatures from 65 degrees on, this temperature however must be hold for a certain time. Louis Pasteur already recognized that through heating water to a certain temperature and time kills dangerous bacteria, viruses, amoebae and worm-eggs. Through a bacteriological test we achieved excellent results by cleaning water with the Metamorphosis (Approch-Tech Laboratory in Würzburg). . Using the Solar-Cooker without sun: What happens if there is no sun for the Solar-Cooker? You can not tell the husband that the food is cold because there was no sun.With this device you can cook in the Solar-Cooker even at night!! You only have to connect a cheap immersion-heater, the rest is managed by the Metamorphosis. The Solar-Cooker is a wonderful isolated Cooking-box and you can prepare food with few electrical energy. Theft-protection: Often it happens that the Solar-cooker and the Solar-panels are stolen. As a new feature, there is a multiple theft-protection integrated now. There is a alarm if the box is removed. One more (optional) Alarm comes if the lid is opened. And if you have Solar-panels connected there is a Alarm if they are touched or removed. In all cases you have a loud acoustic alarm and optional a telephone-call. Producing of hot water for a given time and temperature (for example for coffee or tea). 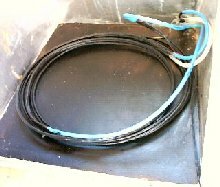 High efficient cooking and clean water-production with the box also at cloudy-days or night by using a simple Immersion.- or Plate-heater in the solar-cooker. The cooker is excellent isolated, so you need few energy. Very simple installation! For the pasteurization you have to put only a black tube and a heat-swapper from copper-tube into this area. Pasteurizing takes place very efficiently through the Versus-Flow-Procedure, the hot water gives the energy back to the cold water. Minimal interventions at the solar-cooker is necessary (a hole must be drilled into the stove). 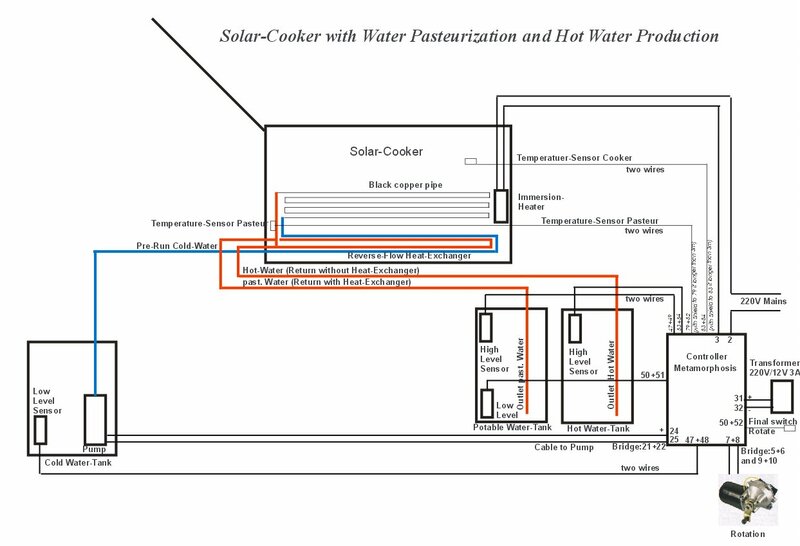 You can even let the cooker follow the sun-position automatically (energy-optimized!). A simple electric motor from a old car can be used for this. You can use the same device for many other functions only by loading new Software. And all the Software is free, you don’t need to pay for it! It is very simple and can be done by all PC’s. Anyway, these are some options you have with the device. But you can have your own features. Say what you want and you get it! Or make your own programming. You get the necessary Software for it! More Information? Click here and download the manual! How does the pasteurization of water works? IIn the free space of a Solar-Cooker you put a plastic or copper-pipe; Through this the water will be heated. After this it will pass a simple heat-exchanger (reverse-flow-principle) for to use the energy of the hot water to preheat the incoming cold water. Through this you will have a very good yield for the water-pasteurization-process. But you can Bypass this to get the hot water for tea etc. The transport of the water works through a small pump, for example a old pump of a car for to clean the wind-screen. In this way you have the water directly where you need it for example in the kitchen. The Heat-exchanger can be delivered by Alternative Technology, if necessary also other components. But isn’t it more interesting doing the things by yourself?